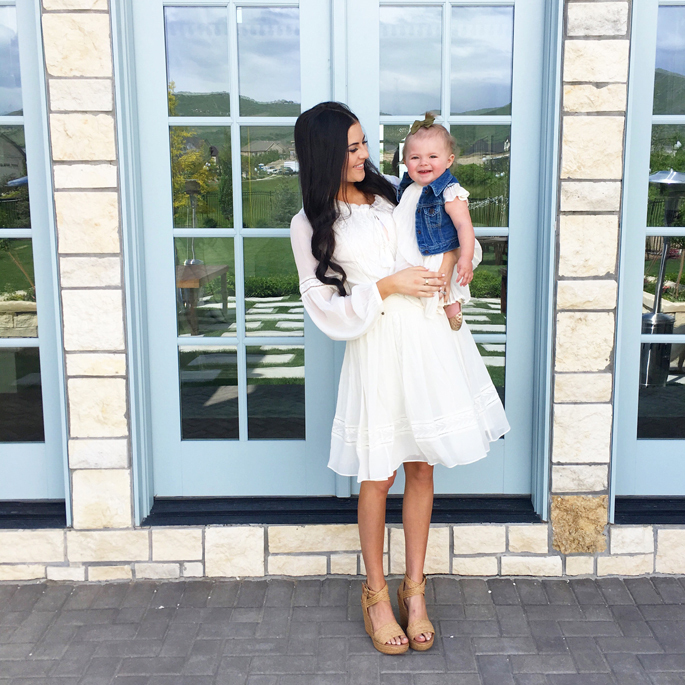 Here’s look at what Isla Rose and I wore yesterday! I hope you all had a lovely weekend. Between my two babies, I’m one worn out mama after the weekend. Baby boy seemed to have yet another growth spurt and this time my back has been hurting me so much more! I also find myself short of breath and getting winded SO quickly (ok maybe that’s because I haven’t worked out since I found out I was prego ;). Little miss Isla has discovered the stairs. I follow her up and down those things all. day. long. (which doesn’t help my back or the winded situation). I think it’s time for a gate, any recs? I’m seeing many pool days in our future this summer (if you’ve ever been pregnant than you know just how amazing getting in a swimming pool feels)! Happy Monday! Pretty dress, Rach! Glad you had a good weekend! Very pretty!! Looking stunning in all the white right now. I’ll have to look into prenatal exercises, that’s a great idea! Gorgeous look!! I love the dress!! Isla looks so cute in her vest!! I bought a white denim vest for my daughter over the weekend. I gave her the choice between white and classic denim and she picked the white one. Will make for a keep layering piece this summer… as far as gates… get a wooden one (with rubber gripping). They look so much nicer than the plastic ones, and they are built very well… its been a while since I’ve needed an item like that, so I don’t have a brand rec for you. Sorry! Hope you start getting to relax more, and find back pain relief! Thanks for the recommendation!! And you look AMAZING in the floral dress on your blog today! Those wedges are my favorite! This dress is so elegant! Love it! This white dress is beautiful!! It has a boho feel to it! So nice and feminine (: love it. This dress is gorgeous and Isla’s outfit is too cute for words!! Hope you had a great weekend! LOVE this dress!! So feminine. I am so obsessed with your wedges. LOVE!! Thanks Cathy!! Cutest romper on your blog today – really making me want summer to hurry up and get here! beautiful dress! 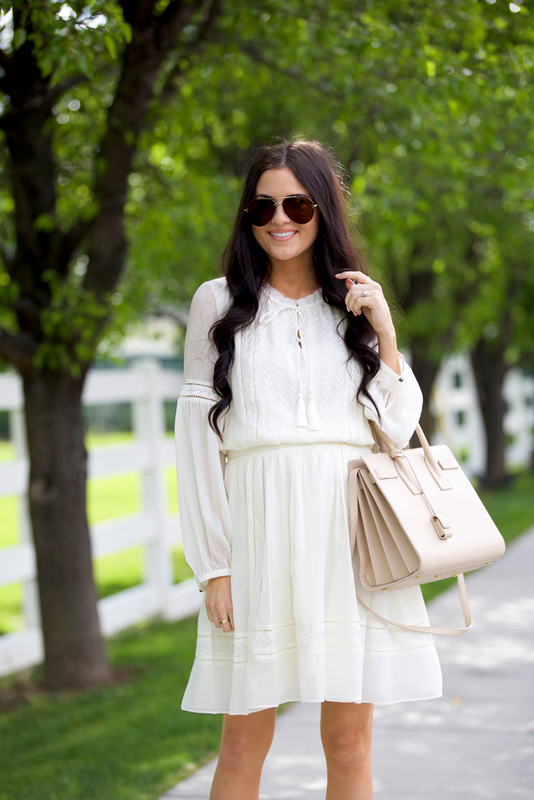 i am loving little white dresses this season! You look breathtaking and are totally rocking maternity style!! Such an elegant and stylish mommy!! Thank you so much Natali!! You two look adorable, I’m obsessed with your dress. It’s perfect for Spring and Summer! Thanks Lindsey!!! Love your Monday Must-Haves on your blog today! Such a lovely light summer dress, Rachel. I love it paired with casual wedges. I think a gate is definitely going to help so you don’t have to stress about your busy little bee. You look very pretty in this dress! Love this look – perfect for the warm weather! We got a Munchkin baby gate that closes automatically. It works great! Cute outfits, btw. Oh thanks for the suggestion!! We’ll have to look into the Munchkin gate. I LOVE your dress, it is STUNNING!!! Thank you Vera! You are so sweet! I love a simple flowy dress! Your dress is very cute! Love seeing pictures of Miss Isla Rose. You guys look beautiful. She always, always, always makes me smile! What a cutie! Such a pretty dress! It’d be perfect for those hot Summer days! I love how the dress ties at the neckline and has those cute tassels! Love this dress! It’s the perfect mix of classic and bohemian. So pretty! This white dress is so chic and feminine perfect for every occasion!!! looks amazing!!! Hope you had a great weekend!! OMG Isla Rise is just the sweetest thing! I love her photos on Instagram! Can’t go wrong with white! Isla’s vest is too cute BTW! I am sooo loving this dress!! I always love a white dress. This one is so chic and pretty but boho too. Love it! Thanks Krisztina!! Love your Editor’s Picks! I love this outfit!!! I have also been loving your newsletter and all the updates to your blog!! Thanks for all of the outfit inspiration! I love this look you! You look stunning ! I’d love to see a post about closet must have (essentials). I’m looking for key pieces in my closet. oh my god, you don’t look like a baby mama, you look wonderful. Lovely looks! Isla’s little vest is so cute! Such simplicity yet so dainty. Loving the pretty dress and falling for the bag too. You look amazing, Rachel! Isla rosa and her little jean jacket so adorable! That’s the prefect summer dress. Loving this whole look! 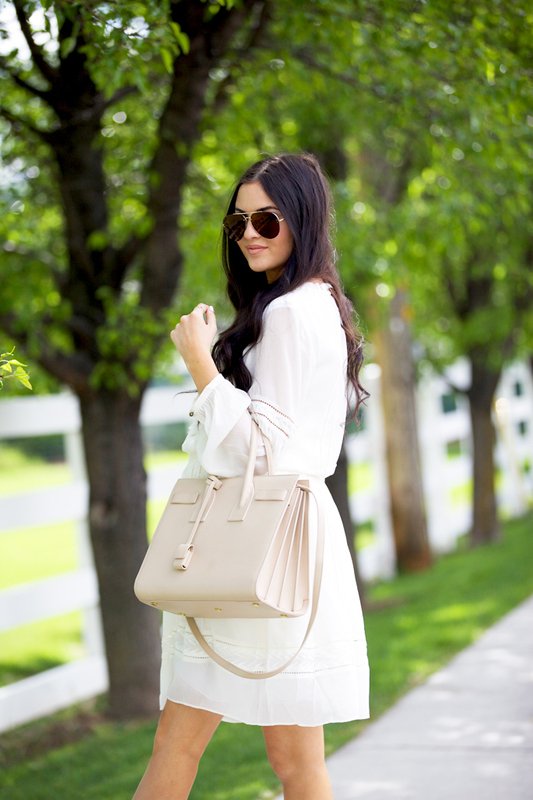 I’m all about an all neutral look and this one is gorgeous! I am in love with the subtle pink color of this bag! So fun and girly while staying classic so it can match everything❤️ Looking for a purse this color! Wow white scurt super nice post..